Hit the Pass | The Card That No One Wanted? The Card That No One Wanted? For the majority of users out there who play card collecting modes in sports games the hook is in the rewards. Most people will spend a certain amount of time grinding away for the stats, wins or collections that can eventually be cashed in for upper-tier rewards. It’s those game changing cards that people dream of – that people will spend an extra hour grinding for or an extra $20 on in-game currency to help shorten their pursuit. But, there are a time and place for these kind of “god cards,” which brings us to the latest development in MLB The Show 17. MLB The Show‘s Diamond Dynasty mode is no different than any other card collecting mode when it comes to upper-tier rewards. The ever-elusive 99’s that people strive to get are present and, typically either very hard to acquire or very costly. This season Sony San Diego introduced the ‘Programs’ aspect of Diamond Dynasty. Programs would contain a block of stat or collection-based missions, each worth a certain percentage towards completion. Each one being finished builds up towards 100% within the program to unlock a special card. The 99 Overall MVP Ken Griffey Jr. card, for example, is a 100% program reward as part of the Diamond Program. The Dynasty Program has been a popular one to work towards mostly because it contains some very excellent rewards along the way. 94 Overall Lou Brock is obtained at 15% completion. 99 Overalls Vida Blue, Cal Ripken Jr, Bob Feller, Miguel Cabrera and Jackie Robinson are all unlocked along the way as well. Getting to 100% in the Dynasty Program, well, that’s where the controversy kicks in. The 100% reward for finishing (more on that in a minute) is 52 Overall Joe Random. Joe Random is what a base created player starts as before any editing is done. Seems like an absolute joke right? However, unlocking the Joe Random will give you access to a Player Epic mission where the reward is fake player, rated 99 across the board named Pepe Alazar. Not a 99 overall card. There are a few of those already. But 99 ratings, in every, single, individual attribute category. Since he was discovered on Friday social media has been on fire with posts about this card and mostly in a negative context. Users are having a hard time understanding SDS’ motivation here and why they felt having the Dynasty Program lead to two fake players was the best way to go. 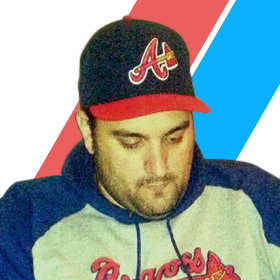 A survey on Twitter found a majority of people (55%) hated the Alazar card while only 7% thought it was a great idea. Those are pretty polarizing numbers considering the scope of this card and how Pepe will affect the game. 1. Every team already has access to an All-99 fake player in the form of their own Dynasty Player. Why did SDS feel the need to give everyone who wants to put in the work a 2nd All-99 player? 2. Why would they decide to use a fake player as a reward for one of their bigger most lengthy programs? I personally feel like it would have been more satisfying to get an actual MLB Legend for completion, not some fake player. 3. The card will absolutely be abused by people who obtain it. The card is actually also now being found in Battle Royale games, although MLBTheShow_Tips has tweeted that discussions about his availability in BR are ongoing and there has been no confirmation of his removal from BR as of publish time. There is no stopping Pepe at all. I’ve actually seen people tweet that they just bean him every time he comes up and then just try to contain him on the base paths. Not a good look for the game at all. 4. It’s still May! Even if Alazar was a card people wanted, having an All-99 card available less than 2 months after release is just silly. Why make him available so soon? These are the kind of cards that should be held back for later in the cycle, not thrown out there when people still have Silver and Gold cards on their roster. Where do they go from here? There is no possible way they can release a better card after this. They have hit the high water mark for high-end card releases and there is still 10 months of game left. ThatSportsGamer’s Take: I’m not a fan of this card at all. While I do feel that you should get an amazing reward for completing everything that the Dynasty Program requires, I would much rather it be a real player, like a 1921 Babe Ruth with 99s for everything, than a fake player. This brings back bad memories of why I quit playing Diamond Dynasty in MLB 13. There are plenty of other combinations to get the 100%. And while its going to take some effort, time and Stubs, it can absolutely be done. I’m not sure why SDS felt it necessary to give the user hundreds of potential combinations to complete this program. It just doesn’t make sense. All the other programs thus far have required that all missions be completed to achieve the 100% reward, but the Dynasty program can be completed with only 4-6 of the 27 possible objectives completed. That’s my biggest issue. This card shouldn’t be available at this point in time during the cycle. I don’t like this card, not even a little bit and it would appear that I’m not alone. Sure, there will be a small percentage of people who think this card is a great idea, they will grind to get him and then abuse him in every single head-2-head game until MLB 18 comes out. The majority of us don’t want Pepe Alazar in the game though. Definitely not now and maybe not ever. Was this the plan all along or is this some sort of way for SDS to deflect away from or offer a “make good” for the disaster that has been their online servers? No matter what the answer is, it sure is a baffling decision in my opinion. One that I feel needs further explanation. 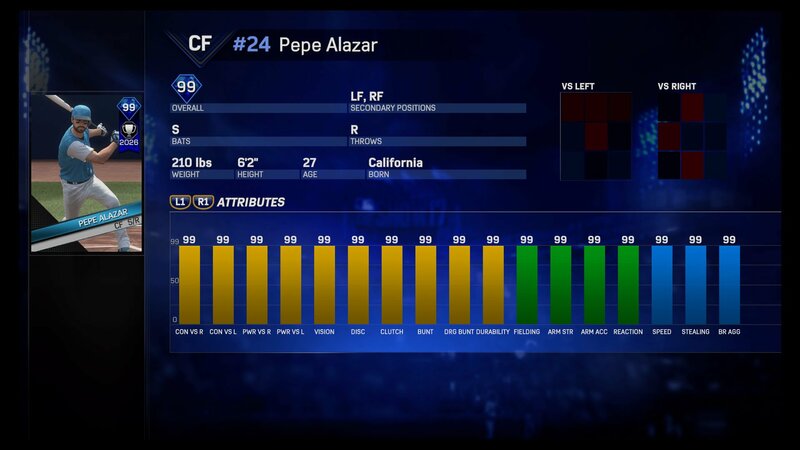 What do you think of All-99 Pepe Alazar? 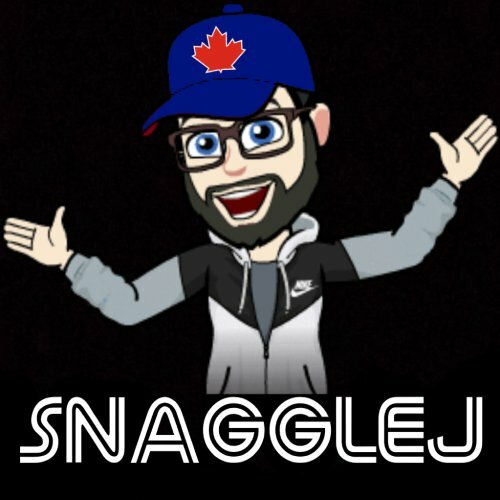 Make sure to hit me up on Twitter @SnaggleJ and let me know!